Traveling by airplane is fast and convenient, but sometimes driving there can enhance the experience. Here is a list of ten places that can be better appreciated when you drive to get there. Key West, Florida – Make no mistake, the trip from Miami to Key West is farther than most are willing to drive but it is worth the experience. Key Largo, the first key, is home to John Pennekamp Coral Reef State Park. Here you can dive, snorkel or hop on a glass bottom boat. Next is Islamorada. Known for its sports fishing, this key is also home to Theater of the Sea, where you can swim with the dolphins. Marathon, the seven mile bridge and the lower keys are next and the water on both sides is simply gorgeous. Once you get to Key West, the last of the keys, make sure you stay for sunset. You’ll understand why you made the trip. The Badlands South Dakota – Driving to the Badlands in South Dakota is like traveling to a different planet. You’ll be faced with geological formations that are beyond words. You’ll also find prairies full of bison, bighorn sheep, and black-footed ferrets that surround your vehicle. There are plenty of places to pull over and explore. Mt. Washington, New Hampshire – The Mt. Washington Auto Road in New Hampshire is only eight miles total and takes only about a half hour to drive, but what a drive it is. The roadway takes you to the highest peak in the region and you may never hold your steering wheel so tightly again. Monterey, California – A trip to Monterey, California along the Pacific Coast Highway is a trip filled with continual oohs and ahhhs. The views of the Pacific Ocean are tremendous and Monterey is a perfect place to stop for lunch, dinner or the evening. Be sure to check out the Monterey Bay Aquarium. 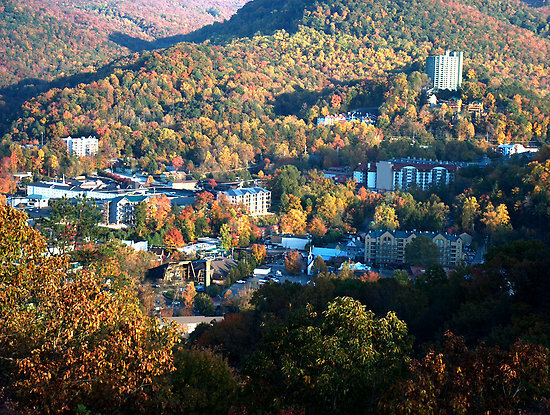 Gatlinburg, Tennessee – Gatlinburg is an interesting combination of tourist attraction, history and natural beauty. Reaching it on highway 441, known as the Newfound Gap Road is perhaps the definition of “half of the fun is getting there.” It takes you through the smoky mountains with opportunities to pull off and enjoy the views. Devils Tower, Wyoming – If you have seen Close Encounters of The Third Kind, you are familiar with this giant rock formation. Driving to it is quite the experience. Rural roadways wind through the countryside as prairie dogs pop up along the way to monitor your progress. Eventually, you wind your way around a corner and there it stands impressively in front of you. Austin, Texas – While a trip to Austin can be a fun experience anytime of the year, traveling by car in the spring when the Blue Bonnets are blooming can be visually stunning. Small towns like Ennis and Brenham are worth a drive to see acre after acre covered in the blue flowers. Wisconsin Dells, Wisconsin – Almost literally in the middle of nowhere in Wisconsin, Wisconsin Dells is an amazing combination of indoor waterparks, amusement parks, camping, hunting, entertainment, dining and entertainment. Well known in the Midwest, other parts of the country may not even heard of the area. It is a genuinely beautiful part of the country to visit almost any time of the year. Portland, Oregon – Driving east of Portland, along the Historic Columbia River Highway Scenic Byway, is an amazing ride with spectacular views. Nicknamed “King of Roads” if you are visiting Portland, go by car and make a point to drive this roadway. Bryce Canyon – This Utah National Park is awe inspiring and perfect for a road trip. Take your time and leave the car behind for a hike. The hoodoos standing rock formations are the most popular attraction at Bryce but outstanding views seem to be around every corner.